The Guggenheim Hermitage Museum’s sculptural volume is designed along Zaha Hadid’s characteristic conceptual terms of fluidity, velocity and lightness. The building appears like a mystical floating object that seemingly defies gravity. 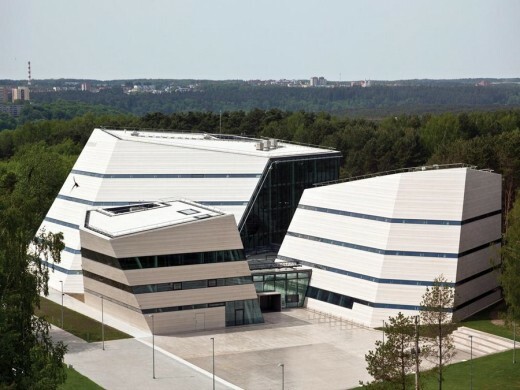 Curvilinear lines echo the elongated contours of the building, offering an enigmatic presence that contrasts with the vertical skyline of Vilnius’ business district. It is a manifestation of the city’s new cultural significance. The Museum’s design points towards a future architectural language. It is part of an innovative research trajectory within Zaha Hadid Architects that embraces the latest digital design technology and fabrication methods. This enables a seamless transfer of Hadid’s characteristic acceleration curves and sculpted surface modulations from drawing board to realization. Zaha Hadid was awarded the Pritzker Prize, considered to be the Nobel Prize of architecture, in 2004 and is internationally known for both her theoretical and academic work. Each of her dynamic and innovative projects builds on over thirty years of revolutionary experimentation and research in the interrelated fields of urbanism, architecture and design. Having first received international recognition through her striking images and designs, Zaha Hadid is widely regarded as an innovative architect who constantly tests the boundaries of architecture, urbanism and product design. An aspect of Hadid’s vision is her interest in the rigorous interface between architecture, landscape, and geology as she integrates natural topography and human-made systems that lead her to experiment with cutting-edge technologies. Such a process often results in unexpected and dynamic architectural forms moulded by the realities of site and building requirements.